I’ve done the research, testing, and buying… there isn’t a better leather company anywhere. I’ll preface the review by saying I am extremely meticulous… Many friends and family members have stated that I border on obsessive/compulsive when it comes to researching products that i plan to buy. Those very people have enlisted me to their causes of finding the best product, value, or deal. I research tech specs, identify resource supply chains, corporate social responsibility practices, consumer reviews (be careful and limit your reliance on direct customer reviews, there are a lot of uninformed out there… many verbally blast companies for not supplying the good/service as expected. Often times, the tastes and expectations of the consumer weren’t understood by the customer themselves. Also, some consumers do not perform due diligence when shopping for the item). I can tell you, I do my research, read reviews, find out how leather is processed, tanned, dyed, treated, oiled, and packaged. “Who are these Montana Pitch Blend characters and why are their products superior? What do they use? How are the ingredients beneficial?” I research best practices for cleaning schedule and method, treatment options, etc. When I first opened the package that contained my Classic II, I was apprehensive about the fit. I played 12 years of football, was a member of the military up until this past January, and lifted weights every day. I like baggy clothing because it is what I’m used to and feel comfortable wearing. The fit of the jacket seemed off to me. I loved the quality, thickness, weight, and smell of the leather as well as the fit and finish of the design. I know what thread works best and looked for tight lock stitches… this jacket had all of these quality measures. I toyed with sending it back, ordering a bigger size, and seeing how that worked out. I was neurotic over this. I spoke to Chippy, Scarlett, Melinda, and others concerning the matter. They were happy to send a bigger size, but held the opinion that the size was perfect and give it a week and see how I felt. All it took was an evening ride. I sat on my 2010 Heritage Softail Classic and didn’t feel what I always had previously… My jacket collar was not choking me to death. The HD jacket I bought with the bike is inherently flawed in its design; the front material is cut far too long which causes the jacket to bunch in the front and choke the rider. Not to mention the extra material adds area that must be warmed by the body heat of the rider. Added area = reduced insulating properties. The Fox Creek Classic II looks and feels good, is constructed using the highest quality leather and materials, and is specifically designed for riding. Over time the jacket has molded to my specific body type/shape and has exceeded my expectations (Which were lofty to begin with… I read all of these reviews… I challenge anyone to find neutral Fox Creek review, never mind negative). Look everywhere on the net… good luck, because I tried and failed. Since the jacket purchase I have ordered/received insulated deerskin gauntlets, Lee Parks Deer Tours, deerskin gel palm gloves, insulated chaps, two wallets, three belts, and a buffalo nickel vest. More to come on that as well. 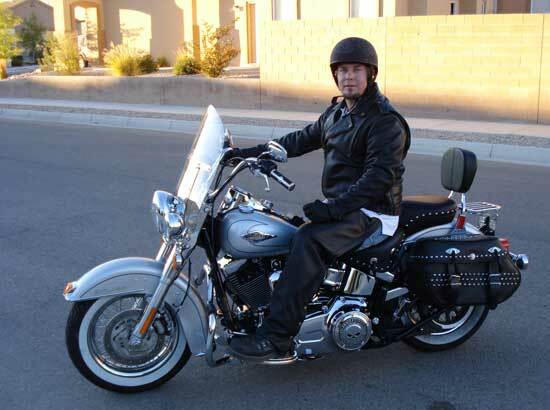 I began riding down the road of “that guy.” The guy that wore a complete Harley ensemble. I did everything I could to avoid that… a large part of that work was directed towards finding a firm that exceeded every expectation of excellence… towards finding Fox Creek. Now I am proudly the “Fox Creek guy.” which is fine because the goods are no nonsense, quality made products (plus they are devoid of gaudy marketing techniques).